Writing Reaction Mechanisms in Organic Chemistry, Third Edition, is a guide to understanding the movements of atoms and electrons in the reactions of organic molecules. 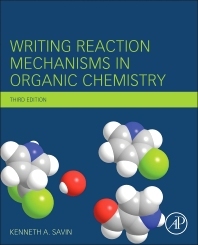 Expanding on the successful book by Miller and Solomon, this new edition further enhances your understanding of reaction mechanisms in organic chemistry and shows that writing mechanisms is a practical method of applying knowledge of previously encountered reactions and reaction conditions to new reactions. The book has been extensively revised with new material including a completely new chapter on oxidation and reduction reactions including stereochemical reactions. It is also now illustrated with hundreds of colorful chemical structures to help you understand reaction processes more easily. The book also features new and extended problem sets and answers to help you understand the general principles and how to apply these to real applications. In addition, there are new information boxes throughout the text to provide useful background to reactions and the people behind the discovery of a reaction. This new edition will be of interest to students and research chemists who want to learn how to organize what may seem an overwhelming quantity of information into a set of simple general principles and guidelines for determining and describing organic reaction mechanisms. 4. Electron-Rich Species: Bases or Nucleophiles?